A newly published study by WCS (Wildlife Conservation Society) has found that impacts of Tropical Cyclone Winston on the coastal communities of Fiji went beyond the immediate loss of lives and infrastructure. The cyclone also had a lingering effect on the fisheries many communities depend on, particularly on the availability of commercially important crustaceans. 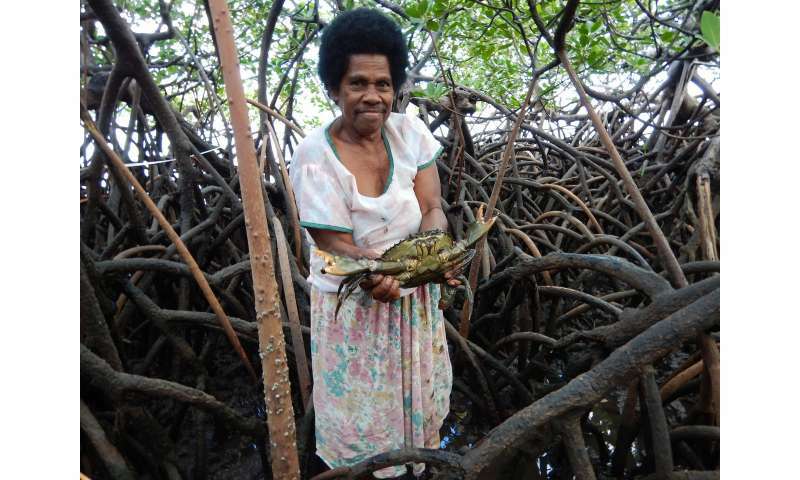 In the aftermath of the 2016 Category 5 cyclone that wrecked widespread havoc on the islands of Fiji, many women fishers stopped fishing for mud crabs altogether while they focused instead on repairing their homes. Fisherwomen who continued the harvest reported fewer and smaller crabs, and catches were sold mostly to local traders to raise money for home repair as opposed to being eaten by fishers. The study titled "Impact of Tropical Cyclone Winston on women mud crab fishers in Fiji" appears in the latest version of the journal Climate and Development. The authors are: Alyssa S. Thomas, Sangeeta Mangubhai, Chloe Vandervord, Margaret Fox, and Yashika Nand of WCS. "It's important to realize that tropical cyclones can have immediate effects on food security and the economic well-being of small villages that depend on natural resources," said Dr. Sangeeta Mangubhai, Country Director of WCS's Fiji Program and a co-author on the study. While many studies on the impact of cyclones on communities focus on the damage done to services and infrastructure, few quantify the impact on community fisheries or the fishers themselves. And even fewer look at the impact to women in the fisheries sector. The research authors used on the mud crab (Scylla serrata) as a lens to better understand the cascading effects of Tropical Cyclone Winston on natural resource use in the coastal communities in the Bua Province of Vanua Levu, Fiji's second largest island. The crab is an important source of food and income for fisherwomen due to the crustacean's large size and delicate meat. The objectives of the study were to gauge the social and economic impact of Tropical Cyclone Winston two to three months after the story, and to formulate recommendations for the government based on the study's findings. The researchers conducted one-on-one surveys with mostly women (who make up the majority of mud crab fishers) in 16 villages located near mangroves, habitat where mud crabs are usually numerous and harvested with consistency. The same villages had participated in a previous survey (before the cyclone) focused on the mud crab fishery. The authors found that, after the cyclone, some 52 percent of the survey participants had stopped harvesting crabs for a number of reasons (i.e. the need to focus on home repair, the difficulty of accessing fishing locations and local traders after the story). Mangubhai added: "The findings that mud crab fisheries are especially vulnerable is key to helping government agencies to design effective strategies to mitigate the effects of natural disasters."